Technically, I am not a coffee drinker and much wouldn't want to try this Kafe Balos or Coffee Alamid for simply because of where it came from. However, being one of the World's Most Expensive Coffee, it made me think that despite of its natural process that really looks like a bit gross, maybe perhaps the finish product would nailed it with a perfect great taste plus the alluring aroma. Indeed, it does. Kafe' Balos or Mindanao Civet Coffee is smooth and low in acid. At first, it tastes like an ordinary coffee but the aftertaste will touch your taste buds with finger-licking caramel flavor. It's just weird that while sipping a cup of coffee, I am still thinking of where this coffee actually came from. But where this coffee really came from? Coffee beans are intercropped into the natural forest of Mt. Matutum which later on became the home of Kafe Balos. The ripe cherries from the coffee tree will be eaten by the Civet Cat but they don't digest the inner beans, excreting them instead still covered in some inner layers of the cherries. As the coffee is stuffed into its digestive tract, the unique process happens. The enzymes and acids inside the stomach affect the chemical structure of the beans; the fermented beans pass through the digestive tract while depositing the enzymes that gives the coffee its unique taste and aroma. So when the Civet Cat poops the beans, people from the B'laan natives collect the civet droppings by hand in the wild. They are then washed in pure spring water and sun-dried in the fresh mountain air. No pesticides or chemicals are used and sell it for 900php per kilo. From the fresh poop of Civet Cat - manual way of grinding the coffee beans - Coffee tasting. The coffee has a nerve disease prevention in which the content of antioxidants in coffee will prevent cell damage associated with Parkinson's while caffeine will inhibit inflammation in the brain, often associated with Alzheimer's. Protect your teeth and reduce your chance of getting a breast cancer. It protects the skin by consuming of 2-5 cups of coffee every day that can help lower the risk of non-melanoma skin cancer by 17 percent. Caffeine can stimulate the skin to kill cells - precancerous cells, and stop the growth of tumors. Most importantly, it prevents diabetes. I understand if you might think that a cup of Starbucks you buy was already on the expensive side, then, think again. Nothing can compare with Civet coffee. Process and price. Nothing to worry for no animals were hurt during the process for everything was naturally done. 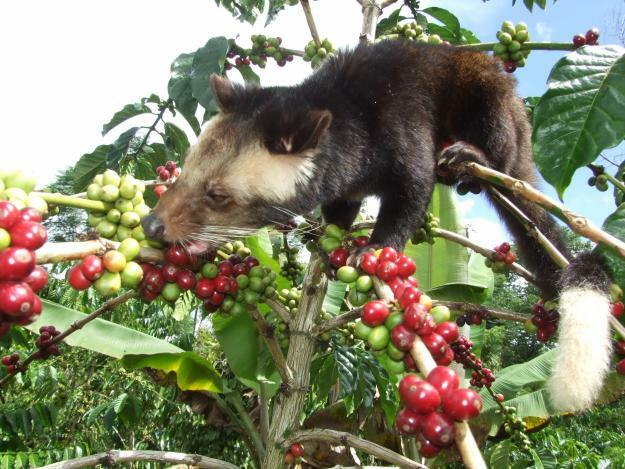 Civet cat eating coffee cherries is part of their habit and Greentropics Coffee did not violate any law. This is the best coffee to try. Pages Flipper got an invite from the PR of DOLE PH to be part of the Civet Coffee Visit and Tree Planting at Purok 8, Kinilis in Polomolok, South Cotabato. This Civet Coffee visit and coffee tasting was just part of our activity with DOLE Philippines. Our Tree planting and trekking adventure will be posted in a separate post, so keep your eyes here. Thank you for reading.